The European Bluegrass Blog: Another European showcase at IBMA WOB 2012? Singer, songwriter, and impresario Adele Ingram (left) of Belfast, Northern Ireland, hopes to be able to accept an invitation to the IBMA songwriter showcase (Tuesday 25 Sept., 12.30-1.30 p.m.) at the World Of Bluegrass Week in Nashville, to showcase her song 'Diamonds and gold'. As Adele does not have the funds at such short notice, she has set up a website where donations can be made for various rewards. On the website you can also read more about her story, see photos from a previous trip to the USA, and listen to the song. She is also looking for sponsors, performers, and a venue for a fundraising concert, for which Belfast Music Week and the Belfast-Nashville Songwriters' Festival have offered to help with publicity. 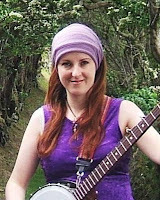 Adele, a member of the all-woman band Wookalily, also runs the One-A-Chord Music Promotions agency and the monthly Bluegrass Pickin' Parlour in Belfast.